I have recently been spending an excessive amount of my free time on Pinterest, make sure to be following me, I pin all my projects onto my “all the little details” board! My link is off to the right side of my blog. During that excessive amount of time I saw a lot of wreaths; spring wreaths, Valentine wreaths, wreaths GALORE! 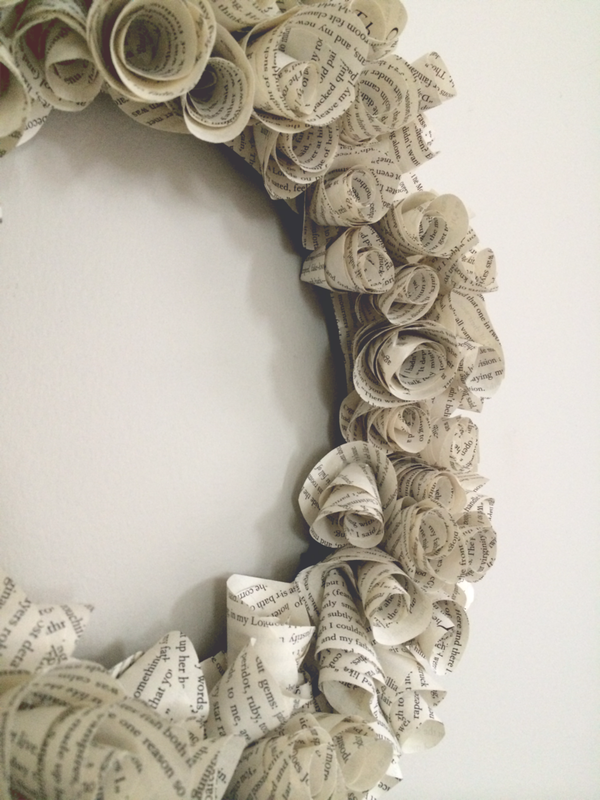 I fell in love with the look of wreaths made of book pages and decided to give it a try and share with you all. First things first hot glue pages onto your wreath (if your wreath ring is wire like mine) as shown, this gives you a surface to hot glue all your book page flowers to. You can measure this step but I just glued the whole page on and then used my scissors to cut off the excess. 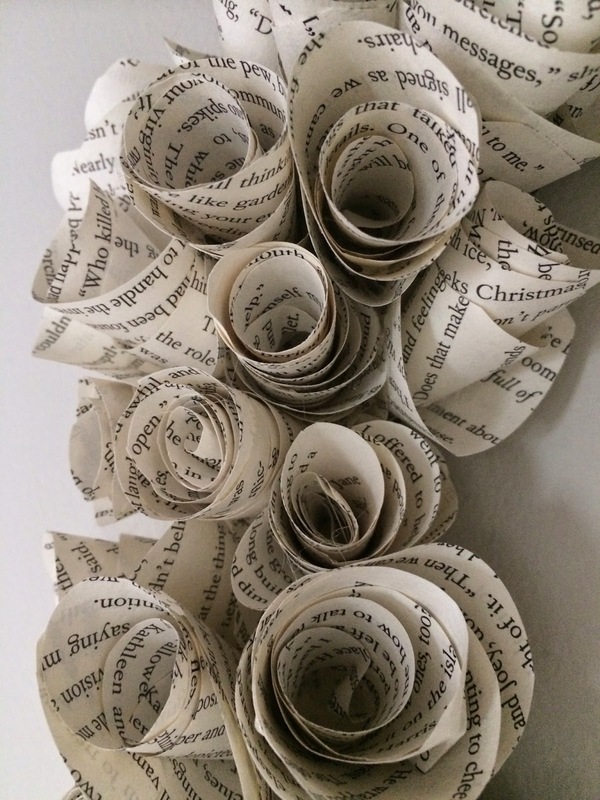 Step One: Cut a circle or oval out of your book page, I recommend varying the sizes so your flower design can change and look more natural and less uniform. Step Three: Add a strip of hot glue about one to two inches long, go ahead and start rolling. Be careful as this can get hot but I was able to create mine without any burns. Step Four: Continue gluing all the way down your flower until its done, and that’s it! 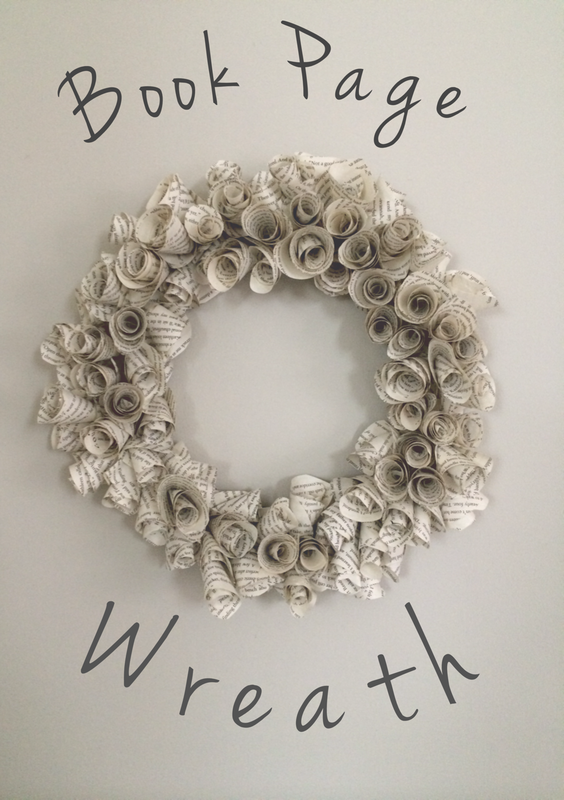 Just go ahead and start sticking them onto your wreath. *I recommend starting with your bigger flowers and work your way onto the smaller ones. After gluing them all the way around the ring I went back in with my littler flowers and used them to fill in any gaps or thinner areas. I couldn’t believe how easy this was to make. The first three or four flowers looked a little rough but practice really does make perfect. After finally mastering the book page flower I turned on Netflix and enjoyed a couple episodes of my favorite show while doing the rest! Feel free to email me any questions you may have or comment below! I wanted to share one of my absolute favorite DIY’s and one of my very first projects I did as a young adult. Years ago when I was maybe ten years old I was given a gift card to a book store. At the time I didn’t appreciate reading and had no specific book in mind to purchase. My mother suggested that I buy a nice copy of my favorite childhood book, which for me was Alice in Wonderland. 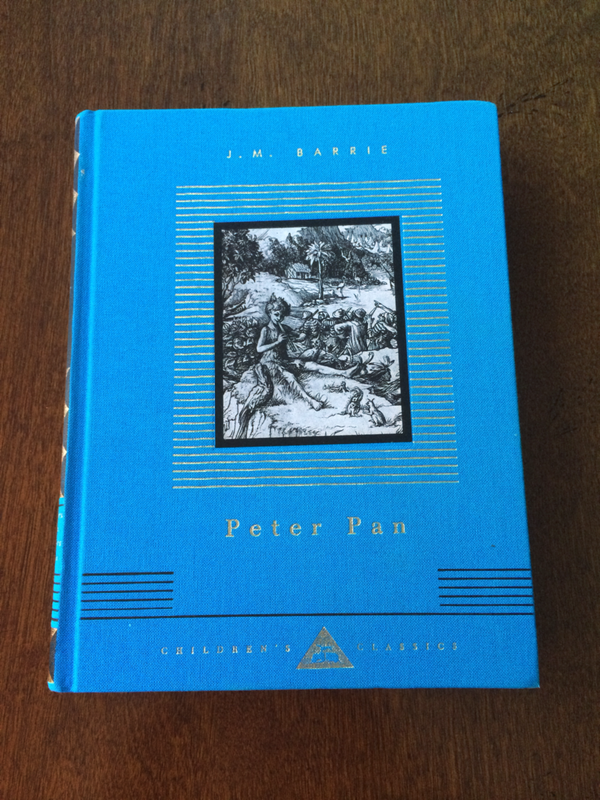 I remember picking the copy I wanted, it had gold lined pages, the illustrations were beautiful, and it was a whopping twenty seven dollars. The book was displayed on my shelf for a year or two but then I packed it away safely in hopes of giving it to my daughter one day. I still think it is one of the greatest purchases I have ever made. Well one year ago I found the same book at the goodwill, with a much sweeter price tag of only three dollars! My boyfriend bought it for me and I displayed it in my bedroom as well. After looking at it for days and flipping through the pages I decided to make it really come to life. 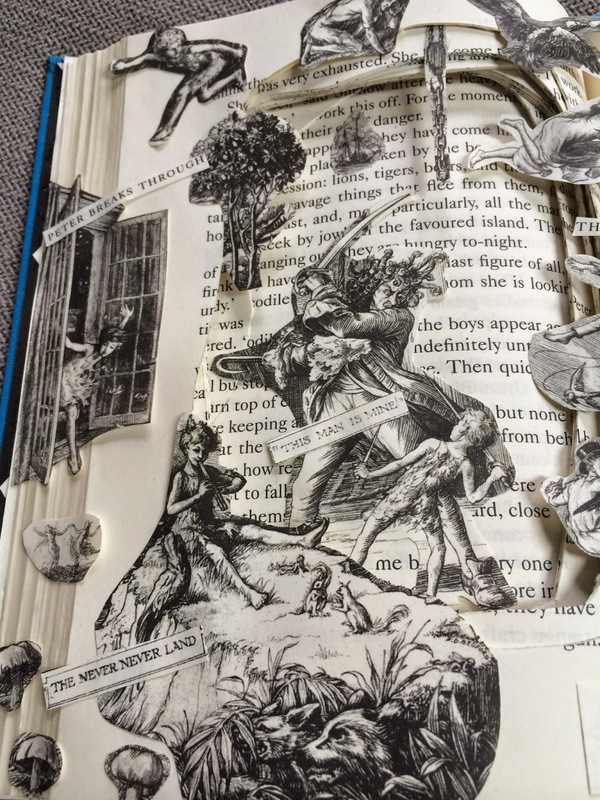 I began cutting the pages and rearranging the images: recreating the story in my own way. 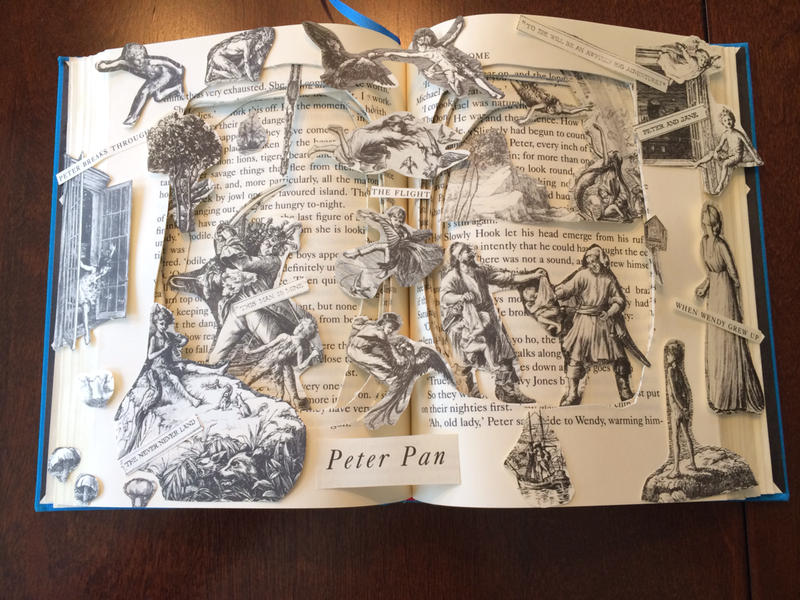 It would be hard to take this DIY apart and show you how to do it so I decided to start from scratch with this beautiful copy of Peter Pan. 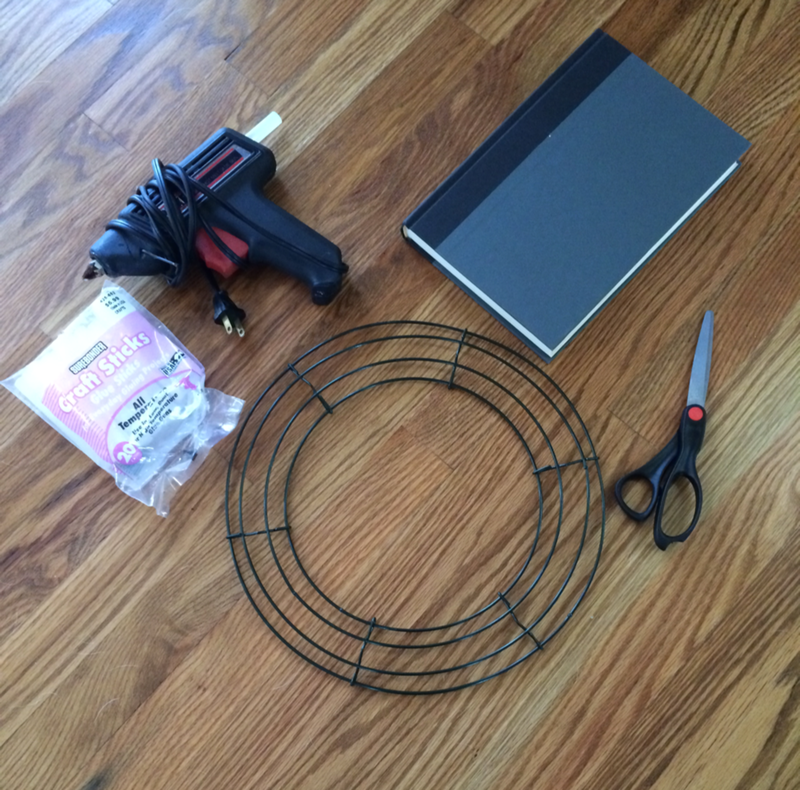 Let the DIYing begin…..
*YOU CAN SEE MY ALICE IN WONDERLAND SHADOW BOOK ON MY “CREATING SPACE THAT IS YOU” POST. 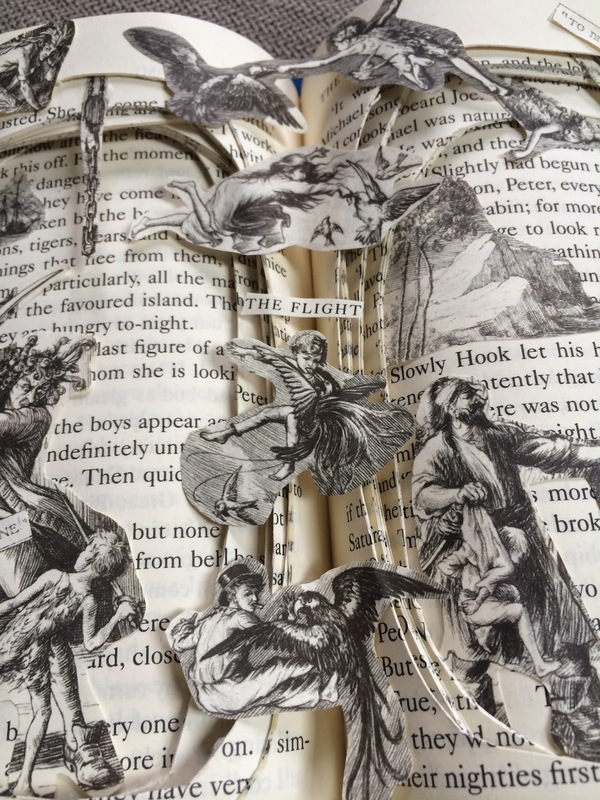 I first start by ripping out all the pages that have illustrations on them, if your book is tightly bound cut them out with a pair of scissors. Go ahead and lay these pictures out and make sure to take a good look at them. 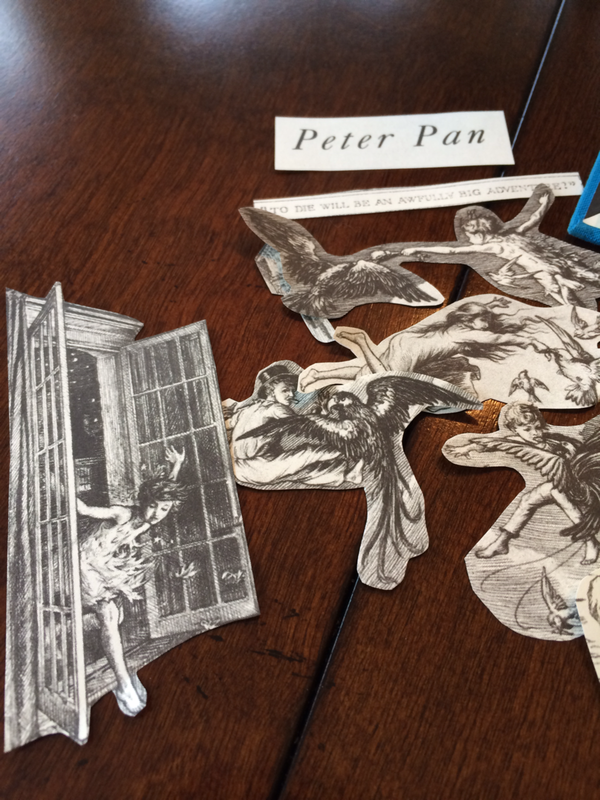 Peter Pan has fewer illustrations than Alice in Wonderland so I made sure to use every detail from my pictures and carefully plan out how I would be using them. Now time to start hacking away at your book. Go ahead and split your book down the middle so it displays nicely on a shelf. 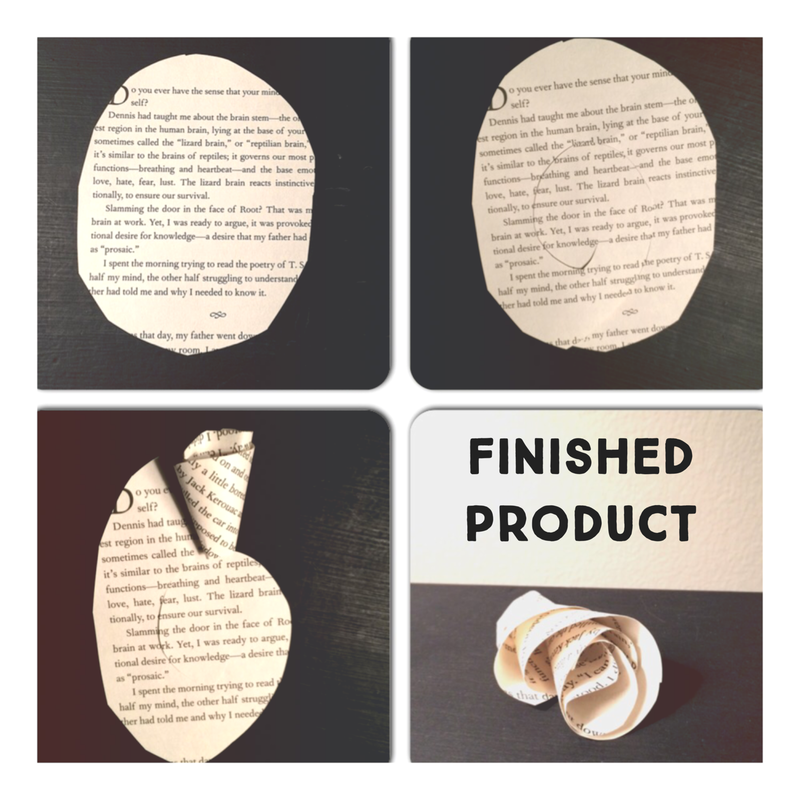 Begin taking a small chunk of pages (I do around eight at a time) and cut different or uneven ovals, circles, or squares (depending on what size and shape your book is) with an Exacto knife. I used a magazine to bare down on between chunks. 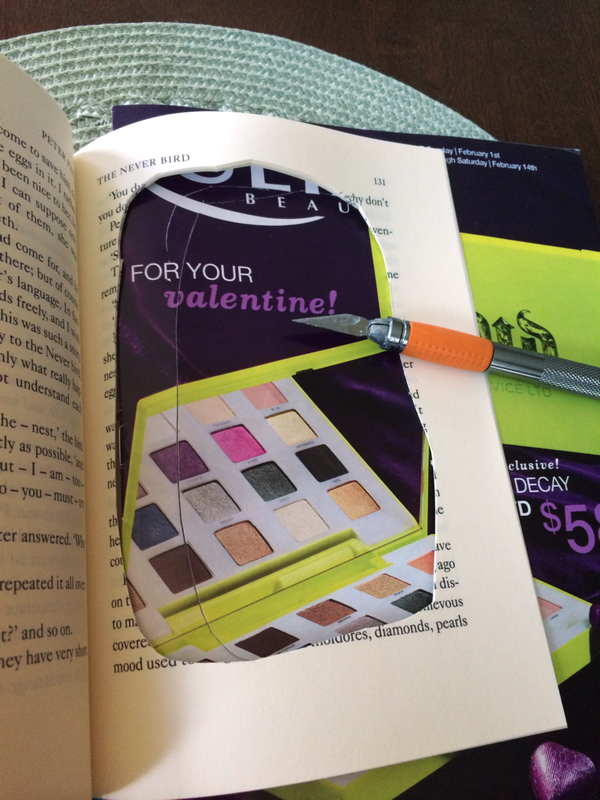 This unevenness allows you to make pictures look like they are literally coming off the pages. 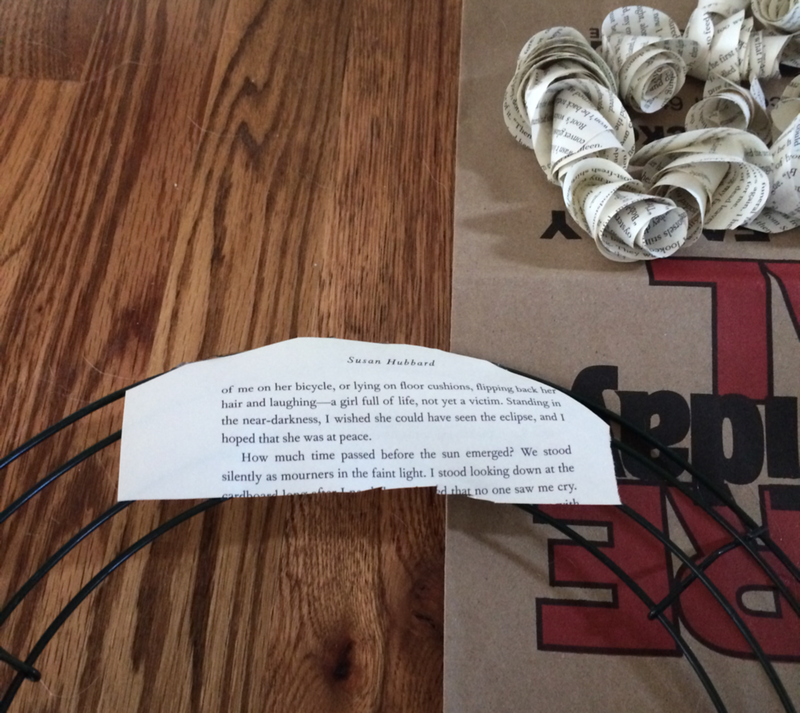 I cut through about 30 pages on each side of my book. 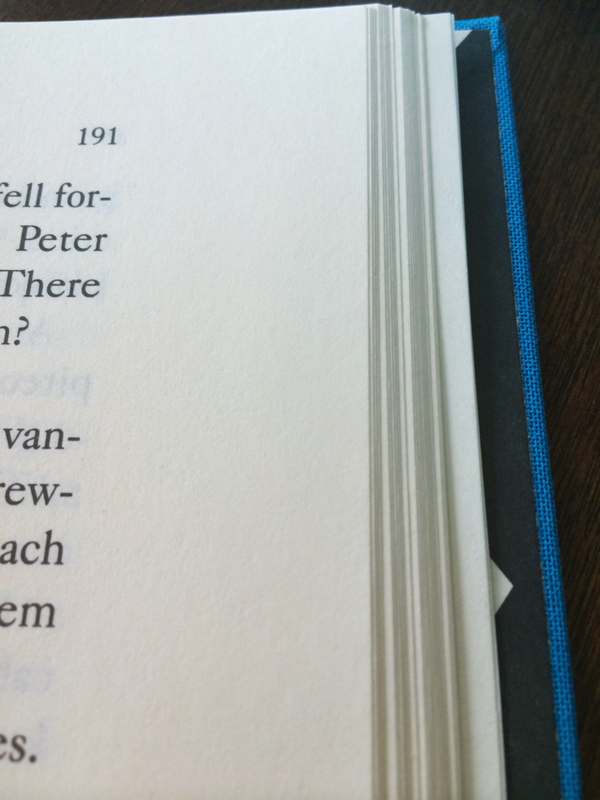 TIP: try to have your page that shows through your hole have text that you like, this adds even more love to your book. Next you’ll need a paint brush and some tacky glue; I squirted my glue on a paper plate and painted it onto the page edges. After doing this set a heavy object on your pages to hold them down. 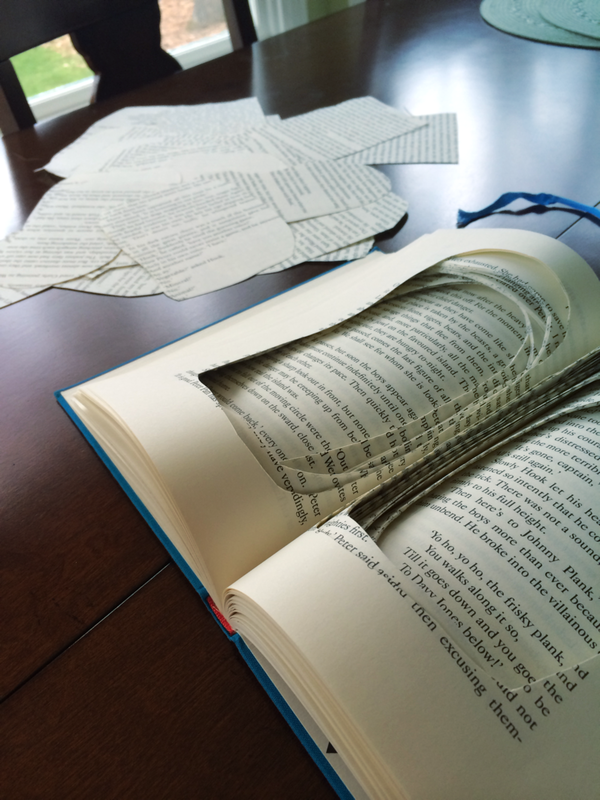 TIP: if you are finding it hard to get all the pages to stick together take some glue on your finger and run it down the pages firmly, this will make sure it gets into all those cracks. 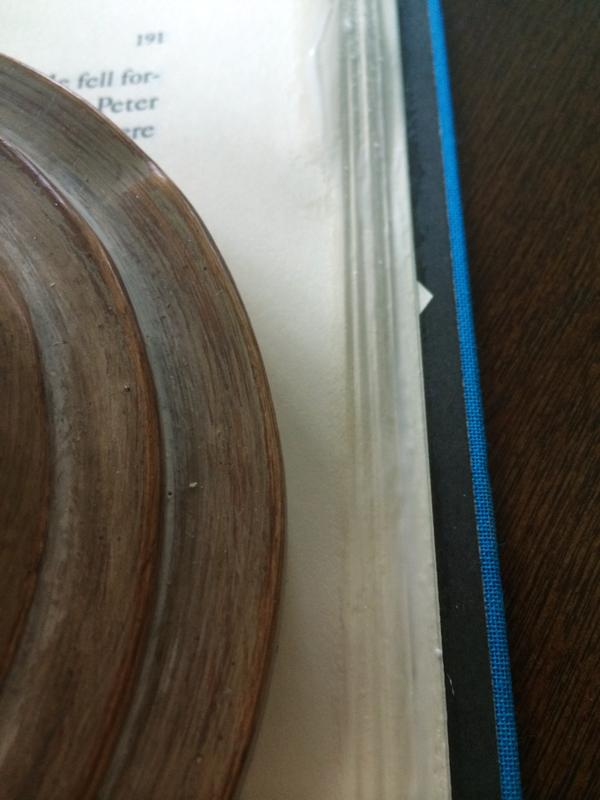 Wait twenty minutes and your book should be pretty durable. While waiting for your pages to dry go ahead and start cutting those images. I like to leave a small edge around my pictures as you can see in my images. 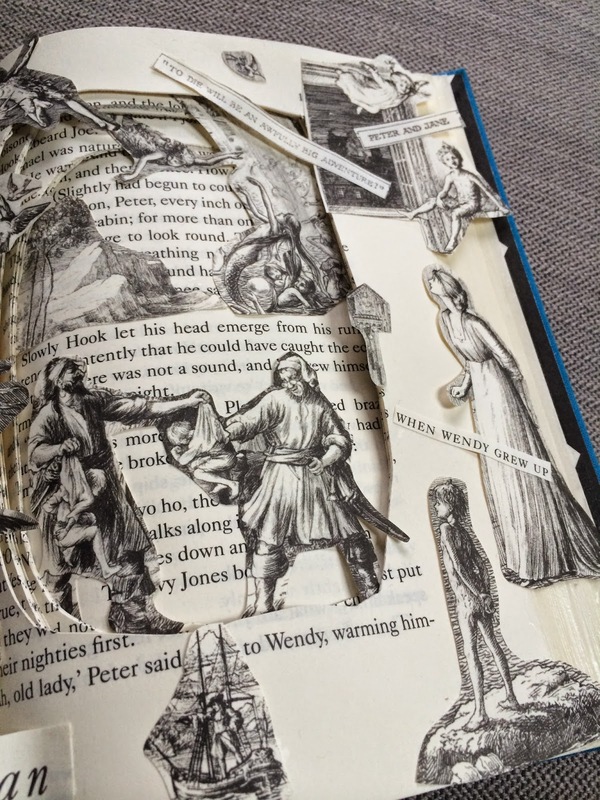 When you are done cutting them out, start laying them onto your book, I played around with my images for about twenty minutes before being fully satisfied. Once you are happy with your layout take that tacky glue and paint brush and begin gluing them into place. TIP: don’t throw away your cut out pages until you are all done, you might end up finding text you want to add to your pictures like I did! 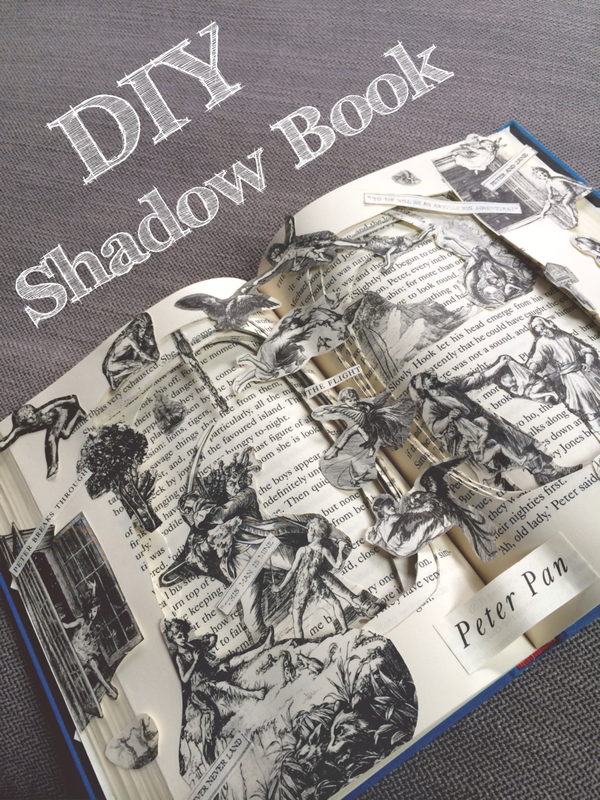 I hope you all enjoyed this Shadow Book DIY. 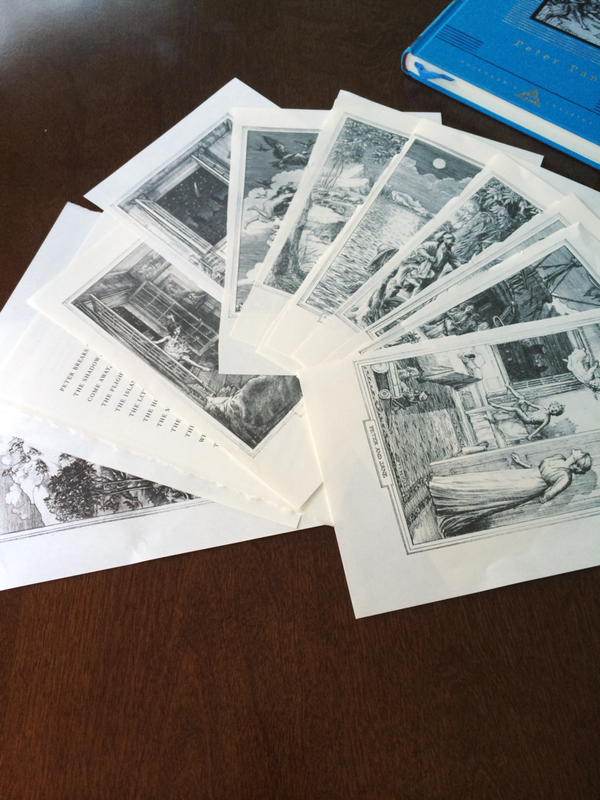 I think these are so sentimental and a great way to remember your favorite childhood story. These would make great editions on your bookshelf or even in your baby's nursery! Welcome to “all the little details” of my life! College Graduate. DIY Addict. Cat Lover. Coffee Drinker. Avid Thrifter. Thanks for stopping by and reading my little corner of the internet where I share my fun do-it-yourself projects, money saving tips, home renovations, thrift finds, and all the little details along the way! Creating Space that is YOU!